CELEBRATION: The International Chefs' Guild Day was celebrated on October 20 and the Chefs' Guild of Lanka planned a day's event to mark this occasion. The event was held with all Chefs in Sri Lanka hotels islandwide. Established in 1998, the Chefs Guild of Lanka, spreads its membership to almost 150 hotels, leading catering institutions and restaurants. The Guild has contributed immensely to uplift and develop the trade by organising various training programmes, seminars, cookery work shops, culinary competitions and social events. During the tsunami the Chefs Guild of Lanka was actively involved in setting up kitchens in the coastal areas of Balapitiya and Hambanthota and supplying food for tsunami refugee camps. Recognising the need of the victims the Chefs' Guild of Lanka provided between 5,000 and 10,000 cooked meals per day. 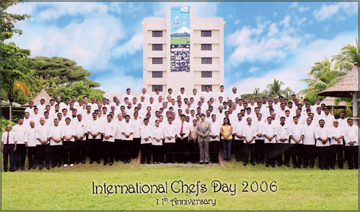 At the world congress held in Auckland in 2006 the Chefs' Guild of Lanka received the inaugural Honorary presidents Humanitarian Awards in connection with the tsunami cooking camps conducted by the Chefs Guild Lanka. During the time of feeding these refugees the Chefs' Guild of Lanka made a firm commitment to find a way of settling the youth affected by the tsunami and to give a proper training to them to take up and eventually be absorbed into the industry. The hotel school located in Hungama was launched on July 19, initially taking off with a three month English programme and thereafter a complete cookery training programme for six months, fully funded by the Chefs' Guild of Lanka. The main cookery programme for the first batch of thirty students will commence on November 2. Don Bosco NGO granted the land to run the project and later on the school has been named Don Bosco - Chefs' Guild of Lanka, institute of hospitality and catering. While the world celebrated the chefs' day new chef is born to take up their chefs' caps and put-on the neck tie to create a new dish. "The happiness of our lives depends on the quality of the thoughts". Keep chefs' flag flying high until, you reach the top of the culinary art which brings you to the world class chefs, said chef Patrick Phillips. By ending the programme the Chairman Gerard Mendis said many chefs have been sent for overseas exposure programs and WACS conferences to USA, Hawaii, New Zealand, Australia, Japan, Thailand, Maritius, Dubai, Israel, Netherlands, Germany and Norway. He also added that local chefs have proved creativity to get the exposure towards the hotel industry in Sri Lanka. WORKSHOP: The Association of Small and Medium Enterprises in Tourism (ASMET) organised a workshop titled "An educational and awareness programme for jeep drivers and trackers" on October 13 at the Sarvodiya Hall, Thanamalvila. Senior Vice President of ASMET Siri de Silva was in charge of organizing this event. De Silva drew attention to the fact that Sri Lanka is an avowedly tourist country despite its immense resources and that we should do everything to attract many foreign tourists to Sri Lanka. The Deputy Director of Wildlife Wasantha Ratnayake drove home some very salient points speaking from his vast experience in the department. General Secretary of ASMET and Chairman Sri Lanka Ecotourism Foundation Palitha Gurusinghe stressed that training was vital in every profession to improve professional skills of people. The Park Warden of Lunugamwehera Prasantha also enlightened the trackers of the problems in the jungle and how they should perform their duties as trackers in an efficient manner. The event was a very useful exercise as an educational and awareness programme for jeep drivers and trackers who meet and handle tourists when they visit the parks. DISCOUNTS: The Ceylon Continental Hotel Colombo will offer delightful discounts at the restaurants to the valued clientele during the months of October and November. The Heist Bar - The ultimate gathering place will offer a splendid discount. You could sip your favourite Cocktail or Mocktail while listening to the latest music at the Heist Bar. Groove to the live entertainment at the Heist throughout the week with popular bands featuring their latest hits and fashion shows by leading models in Sri Lanka will come alive every Friday and Saturday nights. Happy hour is from 5.30 p.m. to 7.30 p.m. and 11 p.m. to midnight. The Coffee Shop - Cafe Emerald that overlooks the pool view and sea view offers a special discount for four people dining in. If four persons dine at the Cafe Emerald during lunch or dinner one person will be complimentary. Delicious cakes the pastry shop - La Patisserie de Paris will also offer an unforgettable discounts during the special offer. There will be a discount of 20% on all cakes like Black Forest, Mocha Cake, Swiss Chocolate Tart, Pineapple upside down cake, Chocolate fudge cake, Chocolate chip cake, Chocolate butter cream cake and Vanilla butter cream cakes for all customers.